This is the third and final post in a three part series on mentoring. Identify a way to track success. Remember my discussion about having 100 students paired to mentors in the first year? Well there was another failure – After the day-long event ended, we said good-bye to the mentors and mentees and did not check in till mid-year. 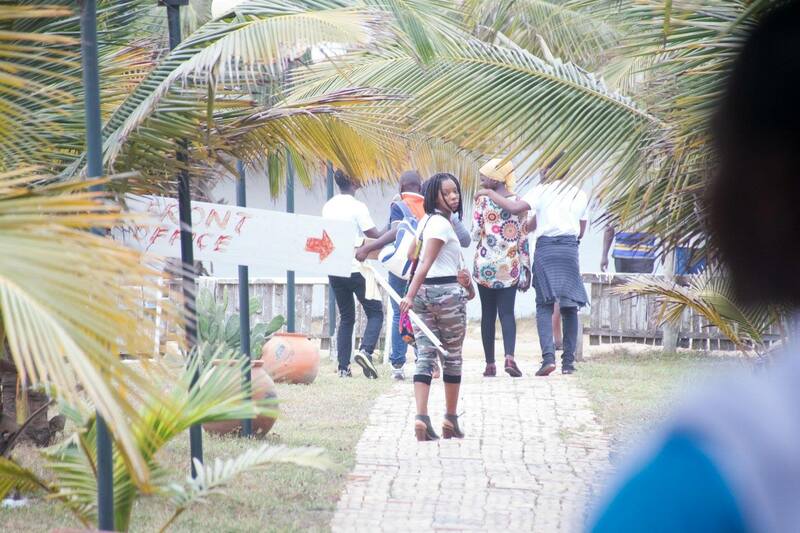 Bad idea!… when we got to preparing for the second annual event, we found that the majority of our mentees had vanished. 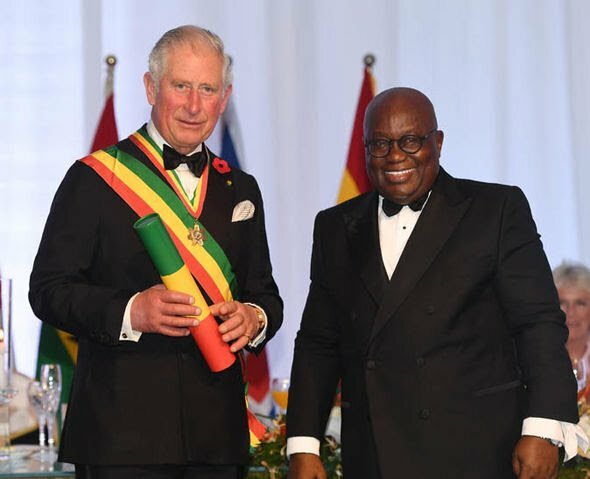 This was due to a situation that may be unique to Ghana, but maybe not – our students are primarily in boarding schools, and in boarding school you have next to no access to the students. 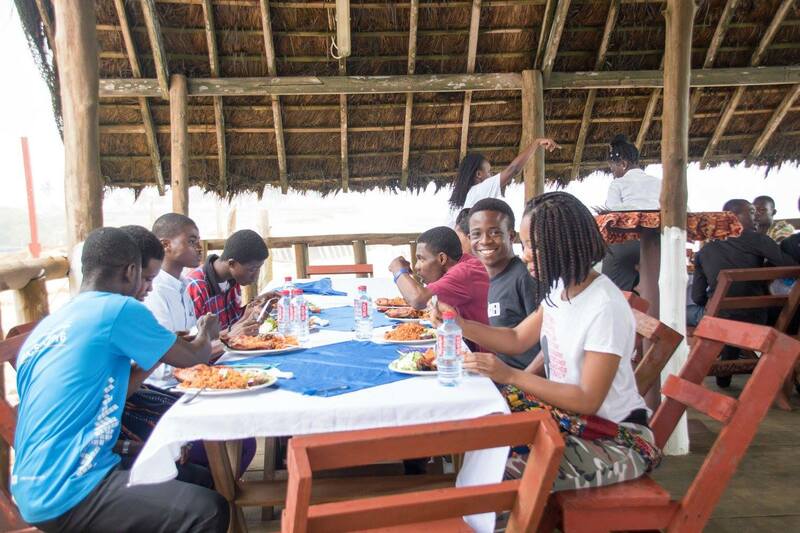 They are not allowed phones, Internet or social media access, which means that unless you’re a very engaging mentor who had already really bonded with your mentee, or you have a highly proactive mentee who will seek you out, the likelihood is that contact is lost after the 3-4 months stay in school. This taught as a big lesson which was that we needed to essentially create a “mentoring office”, so to speak, where we had dedicated people tracking the relationships, ensuring that mentors and mentees were keeping in touch, and if not, finding ways to help them do so. We’ve evolved quite a bit since – now we have mentor and mentee WhatsApp groups. These groups have been super in keeping us engaged with our students and among ourselves, and in guiding the relationships. In fact, mentors send pictures when they meet with their mentees, which has encouraged other mentors to stay active so they can also boast about the strength of their relationship. We also started a mentor spotlight blog where we tell the world about a mentoring relationship. See this post for an example of a Mentor Spotlight. The groups have built a solid mentoring community. We also conduct short evaluations after every mentoring event to gather data on the usefulness of the event and whether we should make any changes. Tracking has also been very useful to our ability to really demonstrate results and impact, which is useful for funding programs, and improving our systems. TIP: Leverage social media and new technologies to maintain a mentoring community – share pictures, conduct short surveys, develop spotlights via blogs, etc. There is no age limit for mentoring! 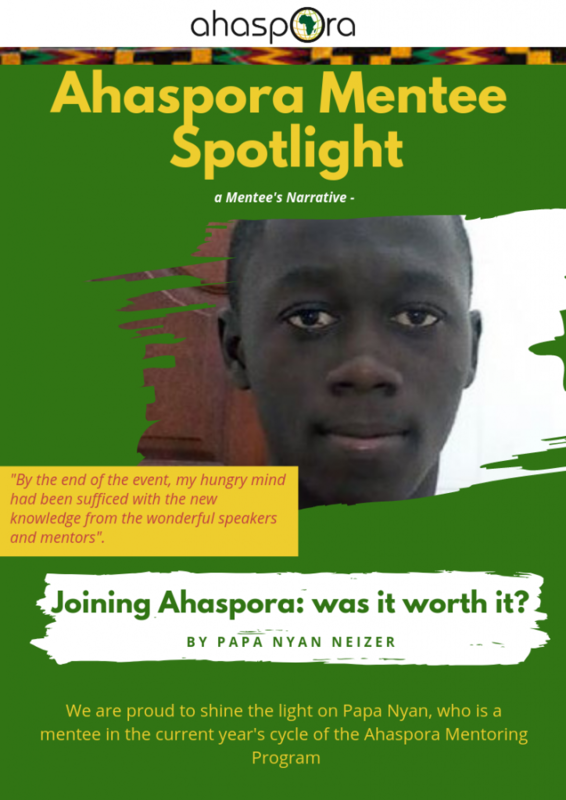 Ahasporan mentees once they have completed high school transition to become alumni mentees and therefore mentors to other high school students. Our aim here is that because they have been exposed to our system for two-three years, there should have been some attributes that they’ve found useful that they want to pass on. As such, we make it a requirement that our students also mentor younger students, and we have a long term goal of creating mentoring clubs in our high schools. 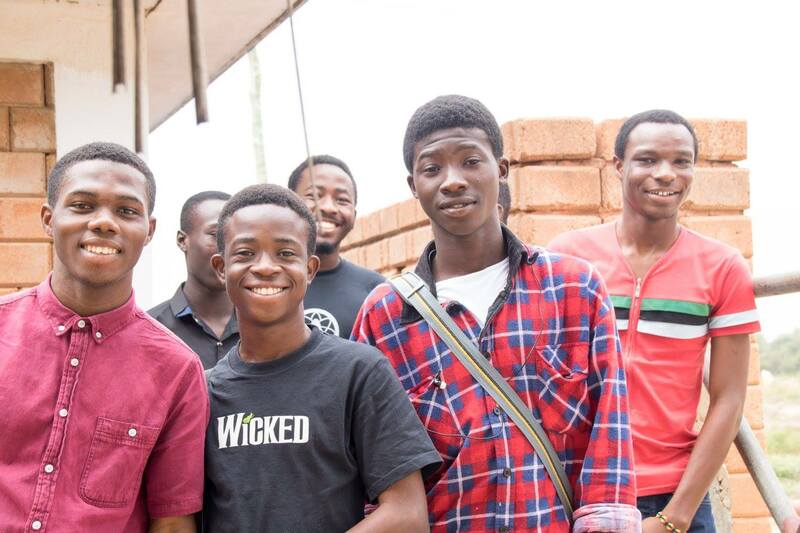 It therefore really warmed my heart when one of our star mentees contacted me to help them start a mentoring club at one of our Ghanaian Universities – that’s when you know you have succeeded! TIP: Very early on in the mentoring relationship, encourage your mentee to contribute in some form to another person’s life. It could be as simple as doing some community outreach exercises such joining clean up campaigns consistently, teaching Sunday school or helping a younger sibling with their homework. The key is to impart the spirit of mentoring to your mentee in one form or another. To conclude, mentoring has been one of the most fulfilling things I’ve ever engaged in. The quote below from a mentee is one that gets me to smile and makes all the organizational nightmares worthwhile. You should try it too! 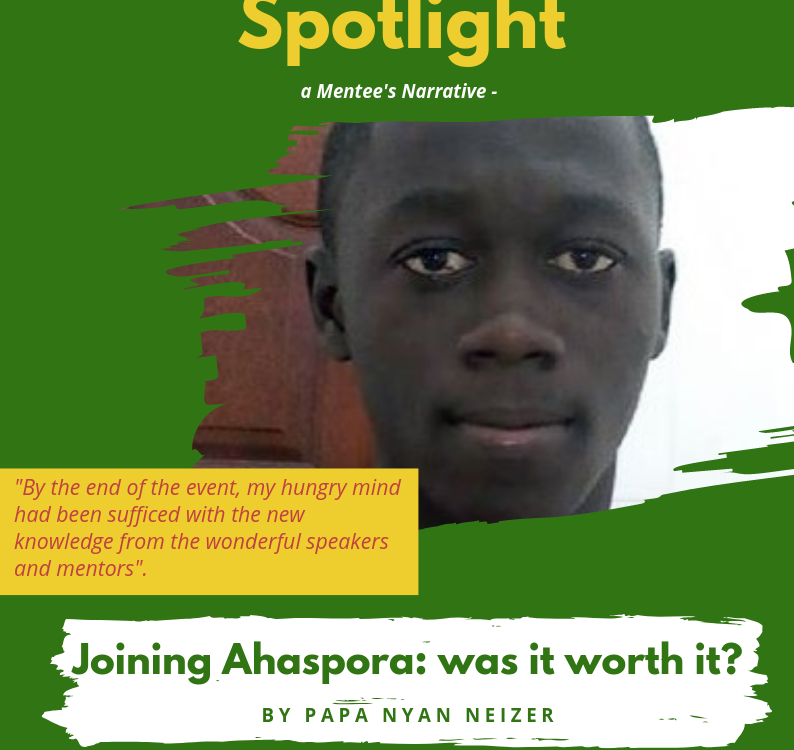 This is the final segment of a three part blog on mentoring by Christabel Dadzie, the co-founder of Ahaspora Young Professionals.